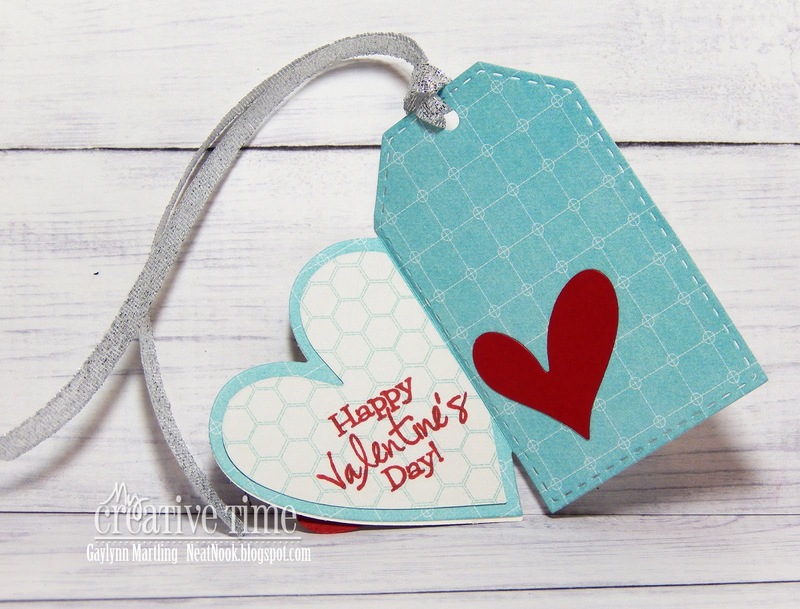 Today, this Valentine's Day treat project is featured on the My Creative Time blog for their Whatever Wednesday post. This little lollipop holder is decorated with some of my favorite MCT products. This was easy to put together. I die-cut all of the flower layers in vellum, die-cut the lollipop holder, the xoxo and the hearts. Then I adhered all of the flower layers together and topped with a red heart. I stamped the kraft color pop die with red polka dot hearts. Then I added more tiny hearts and the xoxo in white. For a little sparkle, I added dots of silver glitter glue to the flower petals. A little bit of red tulle was added to the pop stick. The lollipop holder was fastened together with tan hemp, tied on the back side of the holder. I really like the colors of red, white and kraft together in this project. If you would like to see a particular technique featured or just want to say hello, leave a comment below. I look forward to your comments. 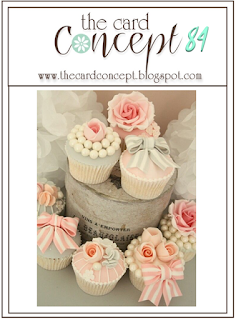 Be sure to visit Miss Emma's blog at My Creative Time for more creative projects for today and then shop MCT. We are lucky ducks to know you handmade card. Today, I am sharing a sweet thank you or thinking of you handmade card with the cutest ducklings in a garden. Sentiment: We are lucky ducks to know you. These are baby ducks and I made them a golden brown color with hints of yellow coming through. They just look so sweet with flowers all around them. I decided to make a background with complementing patterned paper from my stash. Easy layering features the ducks perfectly. Here is a quick video tutorial on how to easily layer different papers with stamping. I like the sentiment. This is great for thinking of you, thank you or most other occasions. Supplies: Unity Stamp Co. Lucky Little Ducks, BasicGrey paper, Copic markers and MFT die-namics. An adorable moose birthday pun card. This is a cute little pun card featuring the moose by Tierra Jackson for Unity. Sentiment: It moose be your birthday. This darling moose was colored with Copic markers and the sentiment was framed using die-cuts. This is just another one of the cute animals Tierra has created for stamping and card making. Here is a quick video tutorial shower how this card was accented. Here is the card a little closer. I kept the colors soft yet woodsy looking. Look at that face. Aweee. Supplies: Unity Stamp Co. Cuddlebug Moose, MFT die-namics, twine and Copic markers. I hope you enjoyed this. If you would like to request a particular crafty technique or just want to say hello, leave a comment. Have a great day. Spring time girl just because card. This is Elise Girl by Angie Blom, one of Unity's newest releases. I like the Spring look of this with the flowers and the birds. This is an all occasion or thinking of you handmade card. I gave her a rose gold glitter border trim accent. I also included Copic coloring, gold sequins and blue adhesive pearls. I included a quick video tutorial for this girl. Supplies: Unity Stamp Co. Elise Girl and So Very Grateful, Spellbinders and MFT dies, Copic markers, sequins, adhesive pearls and glitter paper. A watercolor nautical card for Unity's SMAK Saturday. 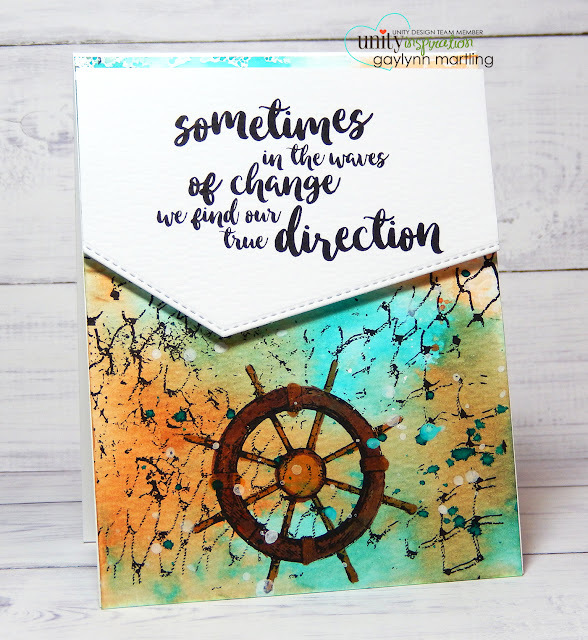 Today, this nautical watercolor card is up on the Unity blog for the SMAK Saturday post. Sentiment: Sometimes in the waves of change we find our true direction. It delights me to see tropical stamps, especially when they can be used in different mediums and for different occasions, not to mention for both guys and gals. This is a mixed media style used, in this case, for card making. I layered the net and the ship wheel stamping onto watercolor paper and then added watercolor. Here is a video tutorial on the ink smooshing watercolor process for this card. And here is the card up close. Supplies: Unity Stamp Co. The Ocean is Calling January 2018 SMAK kit, MFT dies, Copic markers, Ranger archival ink, distress ink, ink sprays and watercolor paper. Thank you for visiting. Have a great day. A watercolor floral anniversary handmade card and video tutorial. Sometimes, a couple of flowers is all that is needed to accent a great sentiment on a card. May your love grow more beautiful with every passing year. For this card, I used a cake stamp which was topped with flowers. They were so pretty that I wanted to use the flowers on their own for this project. I used watercolor and then cut the clusters out. I love how they accent the card sentiment. 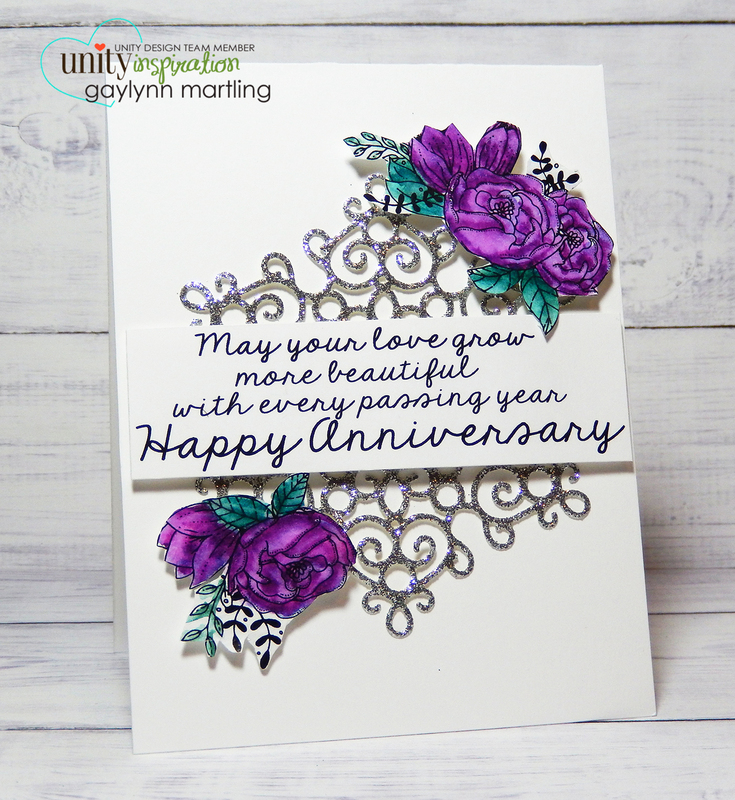 A quick video tutorial shows how this anniversary handmade card was made. Supplies: Unity Stamp Co. Blossomy Confection, Ranger distress markers and archival ink, water brush, glitter paper and MFT die-namics. Hello, it's Gaylynn here for the My Creative Time 75th Edition release, blog hop and sale. For this card, I made little heart shaker by combining two of the heart dies and layering My Mind's Eye papers and clear cardstock. I added sequins, a congrats die-cut and tan hemp to embellish the card. This kind of card is great for any congratulations theme, but especially for love occasions like engagement, wedding or even a bridal shower. My daughter just got engaged, so this little lovely is going out to her. We are so excited for her. Here is a look at the new releases that I used on today's card. Here are my sneak peeks for this release. The details for the projects below are on my previous sneak peek blog posts. Here is a closer look at today's card. I hope you enjoyed my projects. I appreciate and look forward to your comments. Your next stop on the blog hop is Jessica. Birthday cake and flowers pastel handmade card. This is a soft and sweet handmade birthday card featuring a pastel birthday cake with flowers. Sentiment: Wishing a very special person a very special birthday. For this card, I used Copic markers to softly color the cake and flowers. Then I framed the image using distress ink with masking. I added a die-cut scalloped edge trimming and clear droplets for accents. Here is a quick video tutorial on how this card comes together. Supplies: Unity Stamp Co. Blossomy Confection by Angie Blom, Winnie and Walter dies, Ranger archival and distress ink, painter's tape, Copic markers, Simon Says Stamp paper and Pretty Pink Posh sequins. 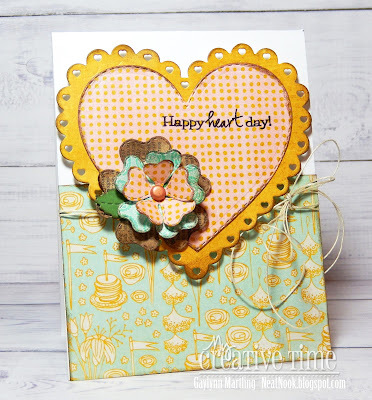 Today, I am sharing sneak peek #3, another of the My Creative Time 75th Edition new releases. This is from the set releasing this Friday, January 19, 2018. This one is called Cute Heart Tag Die. 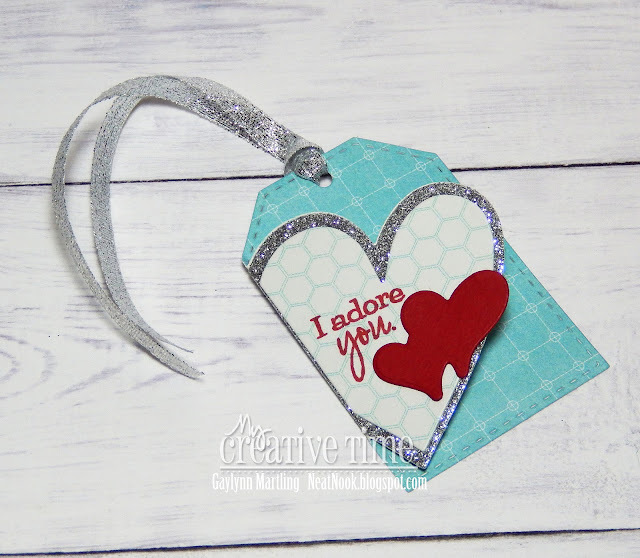 This tag die creates the cutest interactive heart fold. It include layers to fit the inside and the outside of the heart. So many possibilities. I used silver glitter paper and pattern paper layers along with extra heart die-cuts that I had on hand. Here is a look at the inside of this heart tag. Visit Emma's blog to see what she and the rest of the design team has for you today! Check out my sneak peek #1 here and my #2 sneak peek here. Don't forget about the full reveal of the MCT 75th Edition release, blog hop and sale, tomorrow. 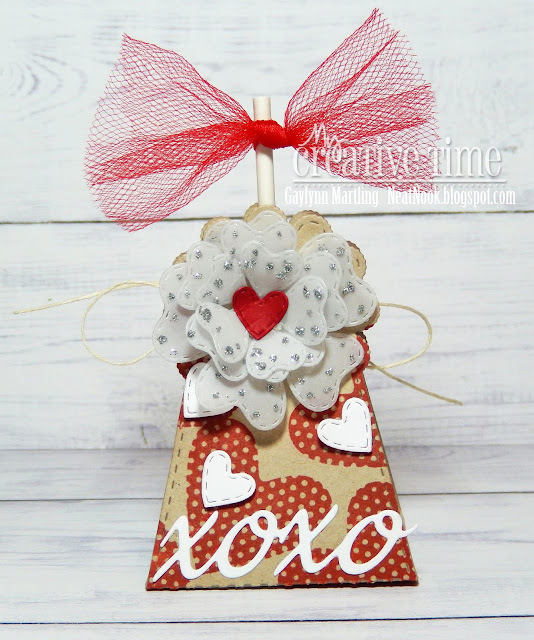 Today, I am sharing a sneak peek at another of the My Creative Time 75th Edition new releases. This is from the die set releasing this Friday, January 19, 2018. The set is called XOXO Border Dies. I wanted a masculine love card, and so I left this without my usual bling and twine. I left it simply layered with the xoxo, heart and love dies. It was stamped a bit and then gold embossed. The addition of the gold glitter paper for the love die was bling enough. Check out yesterday's sneak peek here. See you here tomorrow for more sneaks. 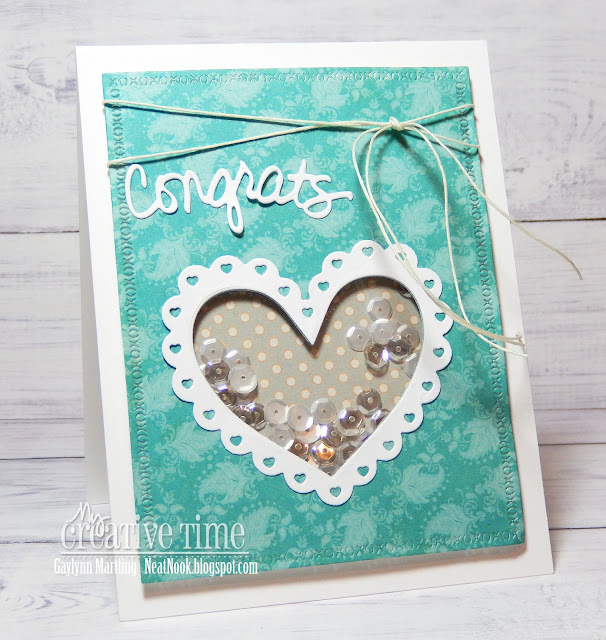 MCT 75th Edition Sneak Peek #1 More Scalloped Heart Dies! Today, I am sharing a sneak peek at one of the My Creative Time new releases. The set is called More Scalloped Heart Dies! This set has a total of 5 dies! 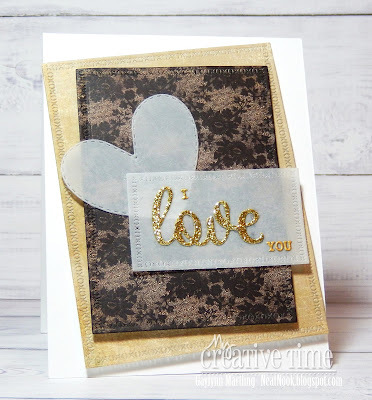 For this kit, I used the larger heart dies with patterned paper, other accent dies and a stamp. I distressed the edges in walnut stain distress ink and added tan hemp. See you here tomorrow for more sneak peeks. Dimensional flowers and microbeads birthday card. Today, I am sharing a birthday card in flowers, made for a special lady. Sentiment: You are amazing. Happy birthday. This card includes dimensional pop up flowers, Copic coloring and a touch of microbeads as accents. I gave it a soft pastel look in pink, teal and gold. 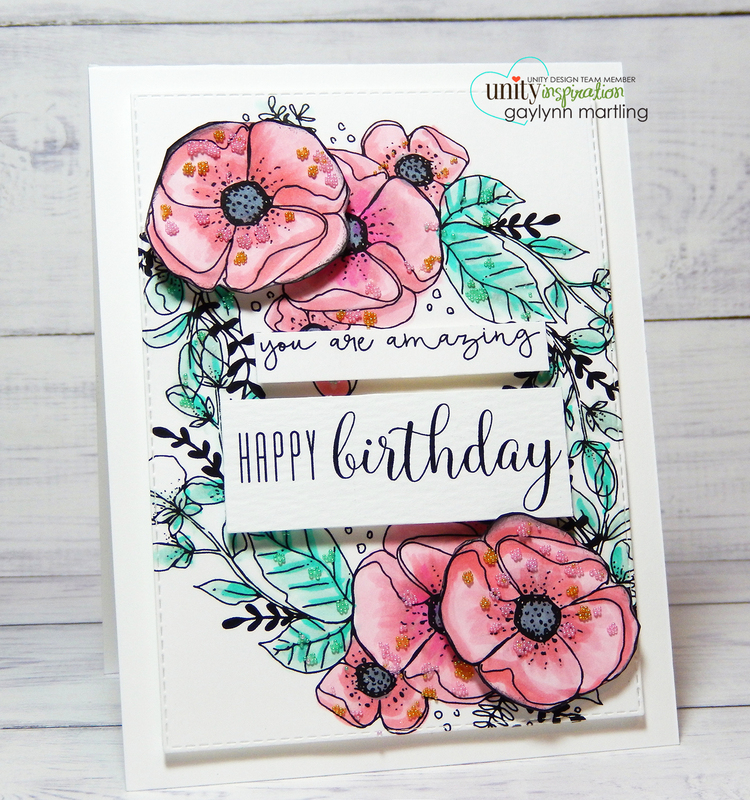 Here is a quick video tutorial for this floral birthday card. Supplies: Unity Stamp Co. My Dear Friend Uniquely Unity, Copic markers, microbeads, and My Creative Time dies. We are having a birthday celebration Unity blog hop in honor of Angela, throughout the weekend. Hop along with us. Happy birthday Angela!! Lift me up birds with Copic markers and die-cuts. This is an adorable thank you card with a winter theme. It is part of the Unity birthday celebration for Angela. Check out the Unity blog hop, release and sale, in full swing this weekend. Sentiment: You always lift me up in my time of need. Thank you. For this card, I used the adorable birdies, colored in Copics, patterned paper and an edge die-cut. The flags and sentiment tag were hand cut. Then, I added embellishments with sequins and a twine bow. Here is a quick video tutorial showing the process for this bird card. 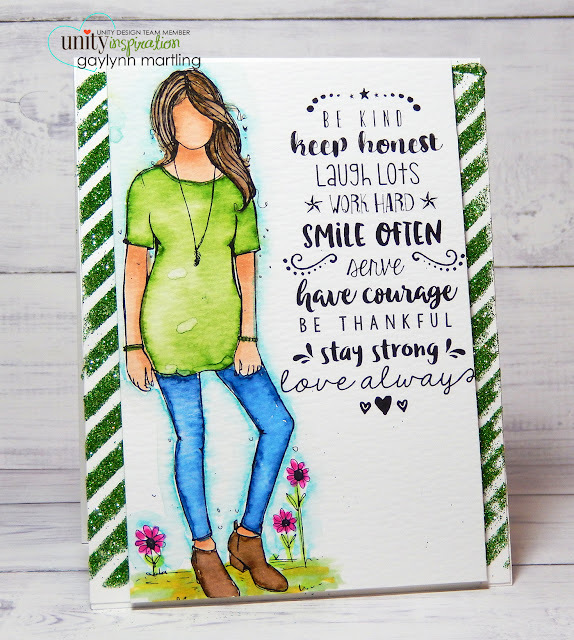 Link Up: Simon Says Stamp Wednesday Challenge ~ Use patterned paper. Supplies: Unity Stamp Co. Lift Me Up Birdies by Tierra Jackson, Lil' Inker Designs dies, Pretty Pink Posh sequins, Copic markers, hemp and BasicGrey paper. Remember to visit the Unity blog hop with prize chances. We are having a celebration blog hop for Angela's birthday, Unity's fearless leader. 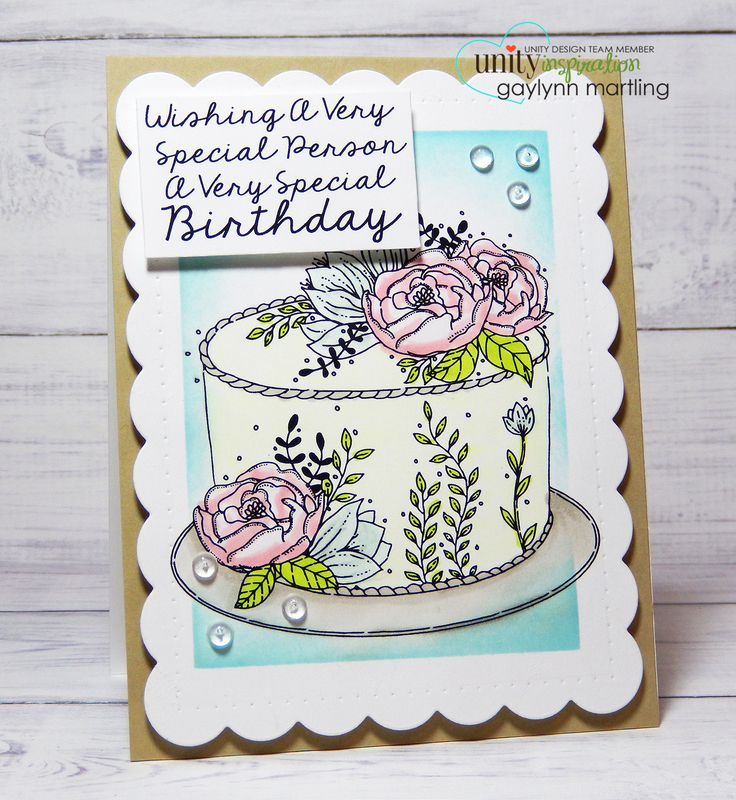 It's Gaylynn here with project inspiration for the Unity Stamp Co. blog hop and stamp release. We are in each other's lives for a reason. Thank you for showing up. I really love the gnomes sitting in the garden. What a CUTE couple. I have heard that they also look a little like wizards. Fun and cute, either way. For this card, I used colored pencils and colored pens. I like to dab a bit of colored pen here and there to accent and make it pop more, especially with the soft look of the pencils. Supplies: Unity Stamp Co. Showing Up Gnome, Lil' Inker Designs die, standard colored pencils, Staedtler triplus fineliner pens and Pretty Pink Posh sequins. The design team is sharing projects on their blogs for this blog hop. You don't want to miss all of the inspiration. Your next stop in the hop is Heather. Remember to visit the Unity shop. Have a fabulous day. Happy New Year. Today, I am up on the Unity blog with this project for Inspiration Wednesday. I paired the girl with this amazing message and then used watercolor. The background was made using gloss gel medium, a stencil and glitter. Here is a quick video tutorial showing the process. Here is a look at this card a little closer. Supplies: Unity Stamp Co. Twinkle January 2018 Kit of the Month, MFT stencil, Liquitex gloss heavy gel medium, spatula, glitter, Ranger distress markers, watercolor paper and Archival ink in jet black. Hello and welcome to my Tag it Tuesday project for My Creative Time. This is one of the tags that I created for Christmas. But it can easily be converted to any theme. 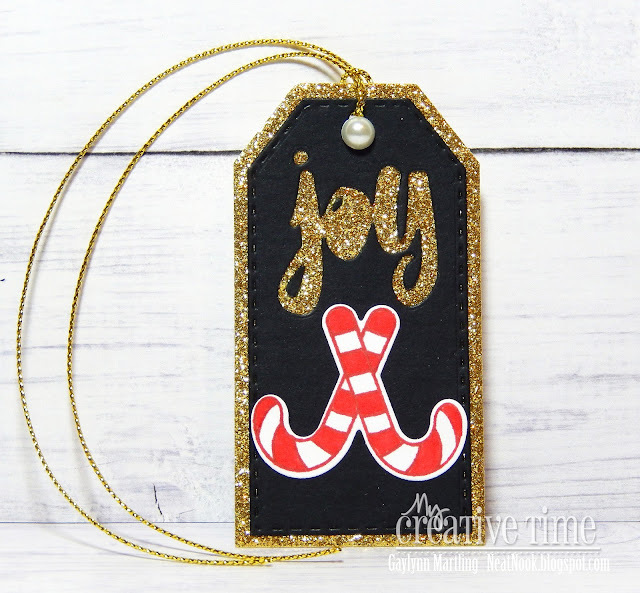 For this tag, I stamped the candy canes and then die-cut it along with the tag layers. The joy word is also a die-cut, allowing the gold glitter background to show through. It was quick and easy to do with just one kit. The tag dies can be used for many occasions. Love and happiness congratulations card.